TORONTO (CUP) — It’s 8 a.m., Feb. 20, and Oscar Navas is starting his morning as an intern at the Dr. Luis Razetti Hospital in Barcelona, Venezuela. Students are on the streets protesting and setting up barricades nearby in coastal city Lecheria. Venezuelan students have been marching in the streets across the country as protests reignited in early February. 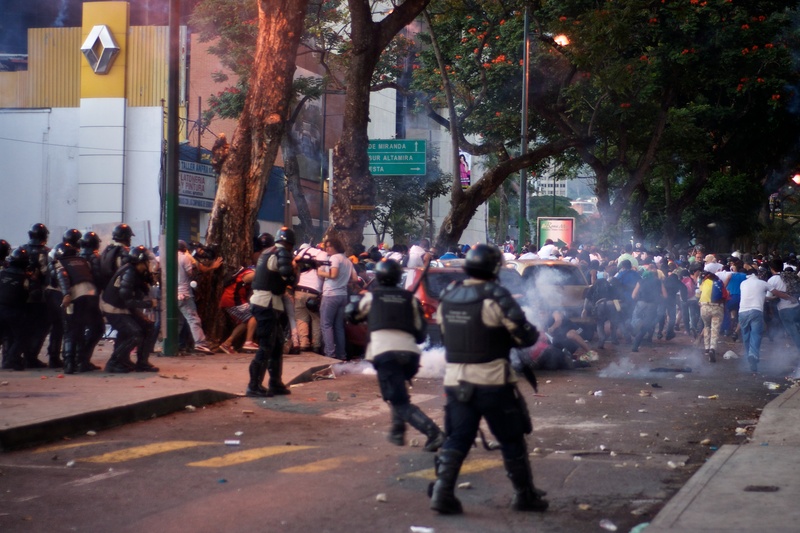 Although student involvement in the protests is being highlighted, much of Venezuela’s population is lashing out. This is not just a student issue. 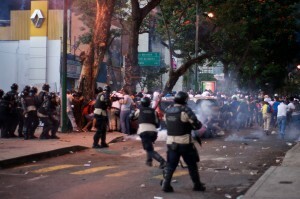 Crime and violence within Venezuela have played key roles in fuelling the protests. Last year, an estimated 24,763 people were murdered in the country, according to the Venezuelan Violence Observatory (Observatorio Venezolano de Violencia), a non-governmental organization. “I would like to live in a Venezuela where I walk the streets without feeling fear,” said Navas, a student at Universidad de Oriente in Venezuela. The teenagers under Navas’ care are not the only casualties of police bullets. These young men survived. The official death toll currently stands at 21 killed during protests, according to Amnesty International. A local radio station calls Navas to gather information about casualties from the morning’s round of protests. The radio station, Unión Radio Noticias, puts Navas live on-air where he tells the audience about the wounds and injuries of the people he sees. “The police forces were chasing me because I said to a radio station what was happening in hospital, things that were happening at that moment, and that’s not fair,” Navas said. Navas goes into hiding where he stays, safe, for 48 hours. “My conscience didn’t allow me to stay there,” said Navas. Venezuela is ruled by the left-wing government of Nicolás Maduro and his United Socialist Party, which was founded by former president and socialist strong-man Hugo Chavez. Chaves died just over a year ago, on March 5, 2013. Though Venezuela has its share of social issues, the political arena is far from black and white. In a country of deep economic divisions, the political interests of Venezuela’s rich and poor have long been at odds. University of Toronto Latin American studies lecturer, Juan Marsiaj, says the situation is not that simple. “How much of [what’s going on] is because of the economic interests of the elite in destabilizing the country?” he questioned. Imperialist powers subtly pulling political strings have characterized the history of Latin America since Europeans landed on the continent centuries ago, Marsiaj points out. The result is a confusing mix of political actors, motivations, power plays and intrigue. This seems to have little effect on the day-to-day reality of the student protesters who are marching, and in some cases, dying in Venezuela’s streets. “I want and I dream of a Venezuela where the people that think differently than those who have the power don’t fear,” says Navas. But he’s already paying a price for that dream. Despite the risks and the fact that he’s on the police’s radar as a troublemaker and organizer, Navas is committed to the process he has helped begin.